The city of Tarentum was founded in 708 BC by Spartans who had been instructed to settle by the Taras River in Italy by the Oracle of Delphi. 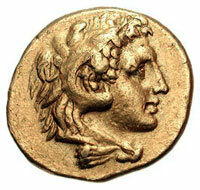 This coin is what is known as a didrachm. The drachm was the basic Greek silver monetary unit and the didrachm (stater) was worth two times its value. Calabria, Tarentum. Circa 276-272 BC. AV Hemistater (4.24 g, 9h). 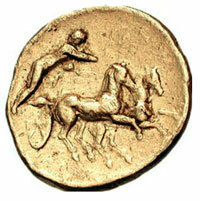 Reverse with charioteer, holding kentron in right hand, reins in left, driving fast. Dewing 182 (all from the same dies). Condition Near VF, a few marks. Very rare. Auction Estimate late 2009 for the Calabria Tarentum – between ?900 and ?1100 GBP. Sotheby`s (8 February 1978), lot 10. Calabria was first settled by Italic Oscan-speaking tribes. Two of these tribes included the Oenotri (roughly translated into the "vine-cultivators") and the Itali. Greek contact with the latter resulted in the entire peninsula (modern Italy) taking the name of the tribe. Greeks settled heavily along the coast at an early date and several of their settlements, including the first Italian city called Rhegion (Reggio Calabria), and the next ones Sybaris, Kroton (Crotone), and Locri, were numbered among the leading cities of Magna Graecia during the 6th and 5th centuries BC. It was conquered by the Romans in the 3rd century BC, but the region never regained its former prosperity.